First up, some dishes that are easily enjoyed alone, either as a snack or full meal. These can be found in markets and kimbap naras, a solo backpackers best friend for dining in Korea. A kimbap nara offers individual rice and noodle dishes, cutlet meals, kimbap or sometimes written as gimbap (maki rolls), dumplings, and other quick, easy to eat options. They are often smaller restaurants recognized by standard height free-standing tables. Often they have bright orange signs. 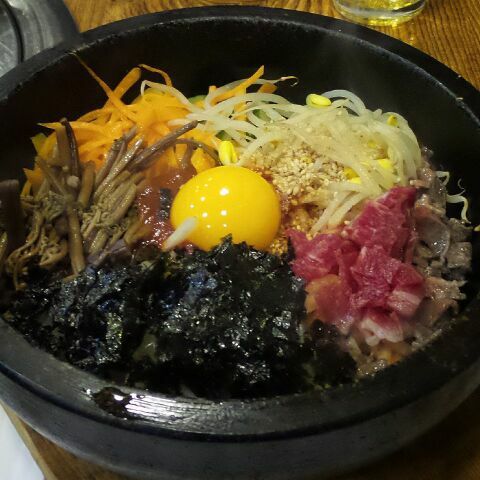 Bibimbap is classic. It’s a great go to for a quick, filling, cheap meal. Served in a bowl, it consists of white rice, vegetables, chili paste, a small amount of diced meat, and either a raw or fried egg. I recommend it dolsot style, meaning served in a hot-pot. The bowl is lined with sesame oil and the rice that lines the bottom gets nice and crispy. Mix well and enjoy. 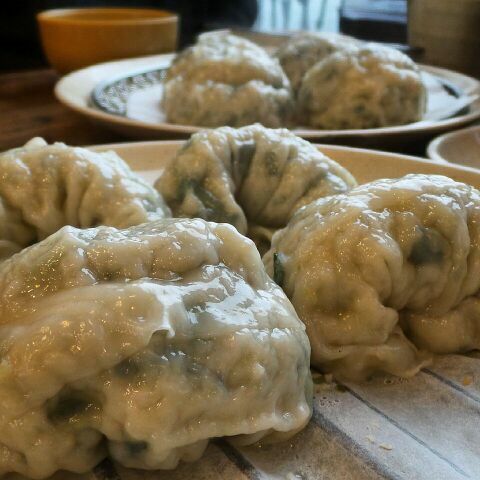 Mandu are Korean style steamed dumplings. 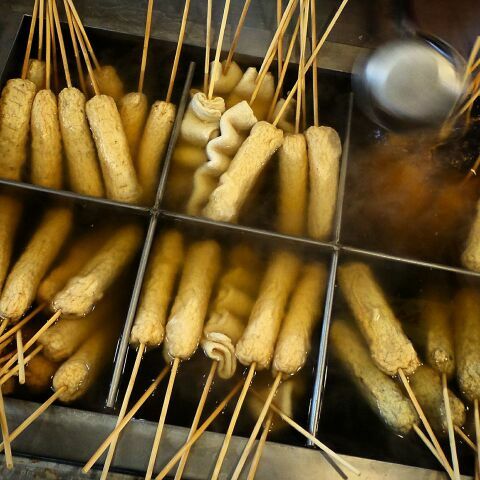 Soft, thin casing, filled with delicious, delicate flavor. They are usually stuffed with soft, ground meat and served with a light soy and sesame dipping sauce. These are great for a light lunch. Odeng. I have to admit, I stayed away from this for a long time. I was under the assumption that this was intestine. Nope, totally wrong. It’s fishcake and it’s a delicious widely available snack. It can be found served plainly in markets and as street food or a little more dressed up with chilis and soy in a steamy hot broth as a sit down meal. 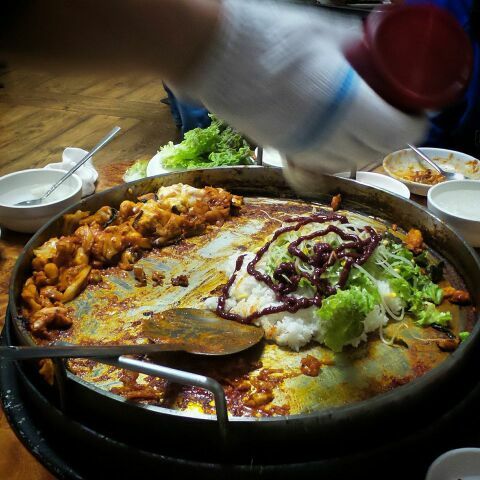 Odeng is best enjoyed with soju and friends in the latter scenario. 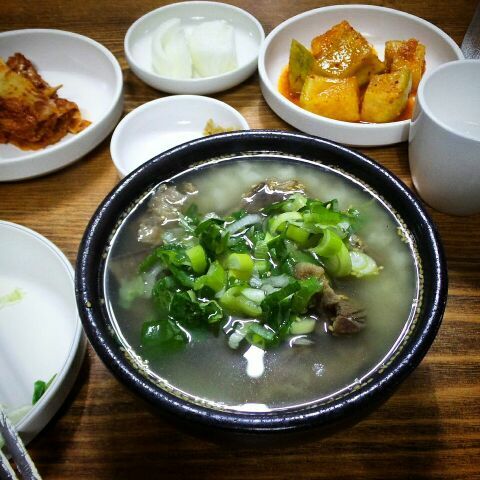 Gomtang also called gomguk, is oxtail soup. The soup is served with rice and green onion. 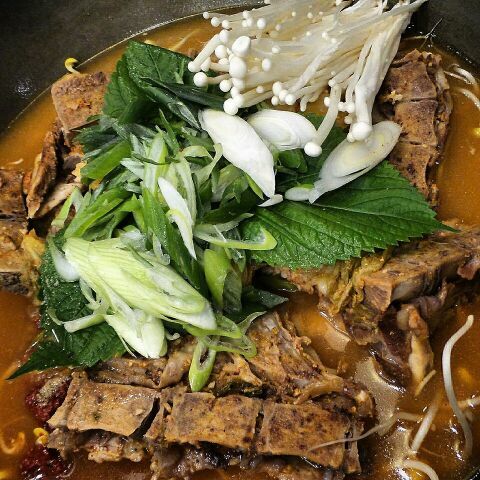 The broth is very light and many people add kimchi to adjust the flavor to their liking. This one came with an interesting side of raw white onion meant to be used to scoop up a light brown, salty, paste. Yukhoe, is basically Korean beef tartar. However, it does slightly differ from its western counterpart. The meat is generally cut julienne style into thick, long pieces. It is often mixed with julienned pear, topped with a raw egg, dressed with sesame oil and soy sauce, though variations exist. I’m sad I have no photo of this, but it’s definitely worth a try. For the next few dishes find some friends and make a night of it. 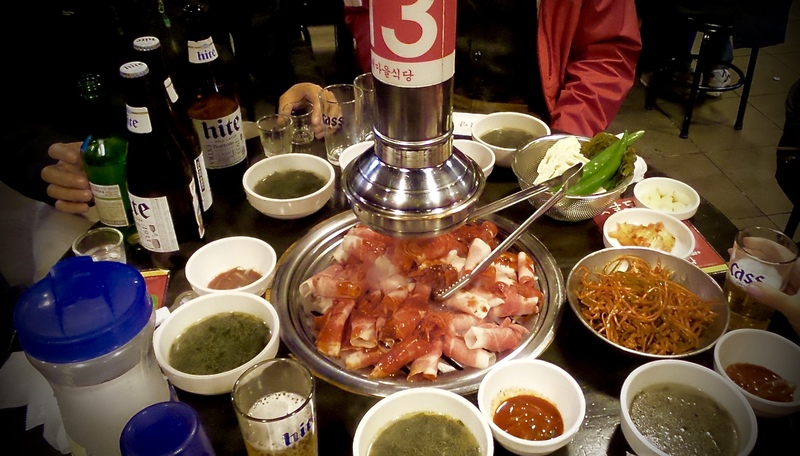 Most restaurants are set up in the traditional Korean seating arrangement. You remove your shoes at the door and make your way to a low table usually big enough to seat four people. Mats are handed out to soften sitting on the floor cross-legged. Because typically, restaurants will specialize in one dish, ordering is easy, you simply indicate the number of people dining. Already decided sides of picked radish, kimchi, and more start to arrive immediately, followed by main meats to be cooked and drinks to be shared. Koreans share everything! Eating is a group event. While in the western world shouting at your server is rude, in Korea it’s the way. The interaction feels strange but it’s normal. A happy, smiling person will rush right over for anything you might need. 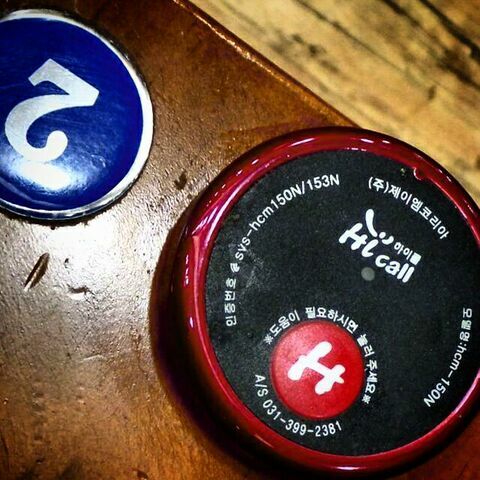 Some larger restaurants have convenient buttons that ring the server, similar to call buttons on airplanes. 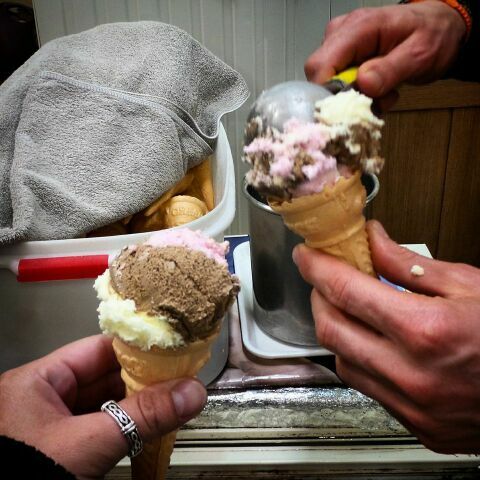 Oh, and don’t forget to check for free ice cream. Not every place offers it, but when they do it’s a pretty nice surprise. 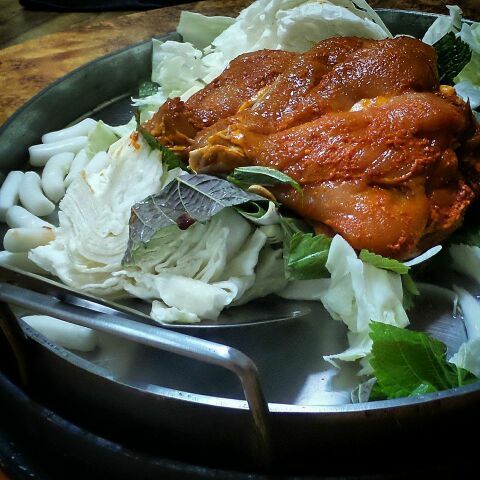 Dak Galbi, is a spicy dish of marinated chicken, cabbage, potato, and tteok (rice cake) cooked at the table. It’s possible to indicate the level of spice you would like as well the optional addition of cheese. It is served with several sides, usually including some sort of chilled soup. Towards the end of the meal when all the bits of chicken and tteok have been picked out you can have rice thrown in. The rice soaks up all the delicious leftover flavor and gets perfectly crispy. 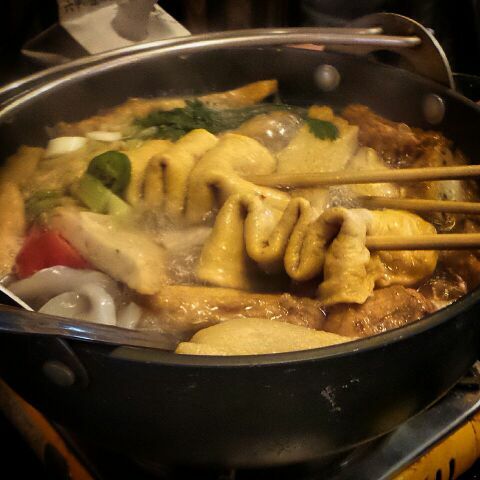 Gamjatang is pork spine soup. Large chunks of bone are added, usually vertebrae and ribs. 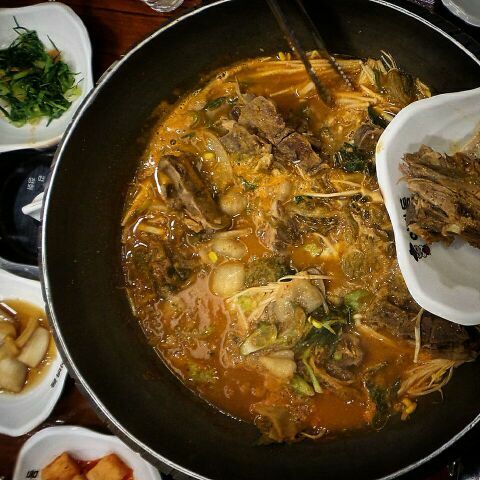 The meat becomes extremely soft and falls right off the bone, adding a ton of flavor to this spicy soup. Like the dak galbi, once the soup reduces down and all the bits have been picked out, you can add rice to scrap up the concentrated flavors still glued to the sides. Bulgogi translates to “fire meat” and consists of thin pieces of tender beef that have been marinated in a full flavored, sweet and salty soy. It’s popular to have this with lots of whole cloves of garlic either raw or thrown on the grill. Like with many BBQ dishes, it is commonly served with lettuce for wrapping. This just might be my favorite. And on that note, I’m hungry. Time to eat again.